THIS IS THE fourth version of the rules, which have radically changed and developed to be virtually an entirely new set. So, what’s changed? Leaving aside minor developments, such as the inclusion of hovercrafts (surface skimmers), the fluid rules for unit coherence - which means what defines a unit - have changed and become hugely important. Now morale is being checked by unit, not per side, which makes games more fluid and interesting. We’re quite excited about this change, since the way morale and flexible units interact is, so far as know, unique and works really well. 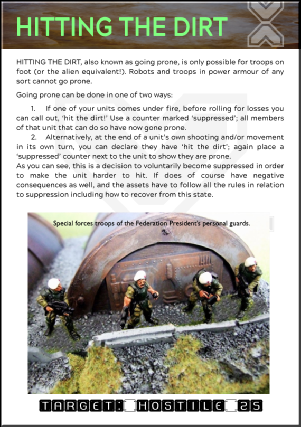 As part of the brand new morale rules we’re working on the assumption that the best man (or woman, alien, or whatever) in the unit will galvanise the rest. In other words, a grizzled officer of years’ experience can cajole or exhort a bunch of unenthusiastic militiamen to great feats of valour! Of course should that same officer bite the dust, morale will plummet since the militia have to look to themselves. This can make a militia unit like that effective but fragile once it loses its officer! The shooting system has been revamped. During development we created a system using different die rolls for single-shot, semi-automatic, and automatic weapons. Automatic weapons, for example, had more chances to hit, which feels right. There were lots of small tables to use for shooting, depending on the sort of fire being delivered and the sort of target engaged. The ability of the shooter was also accounted for by the tables. However, after much brainstorming we managed to greatly simplify the system while giving the same results. Now a simple but effective system is used to see if a hit is scored. The further away a target it is, the harder it is to hit using an interesting system to hit a target. While not claiming this is unique, it might well be and is a development of an idea we had about twenty years ago! Once a target is acquired, you can check to see if any obscuring cover in the way will take the hit, and if it does whether the projectile penetrates the cover and manages to hit the actual target behind. Then we decide if any protection enjoyed by the target prevents it becoming a casualty. This approach was taken to make it quick and easy to work out who has hit what, and why, while accounting for various factors in a simple manner along the way. It is assumed that if a shooter can see a target on a tabletop, it can engage it. Effectiveness drops off the further away a target happens to be. Pistols and short firearms such as carbines beloved of many troopers do have effectively shorter ranges. You could see this as a deliberate policy by some military authorities, issuing carbines for example to stop troopers wasting effort in shooting at range when they should close and engage. In other words, to encourage an offensive doctrine. Alternatively it could be because such weapons are better suited for use in confined spaces (this difference is reflected in the rules). Pistols can bring an advantage in close combat, giving a reason to use these short-range weapons instead of carbines, which have a longer range but no close combat benefit. We class figures with short firearms, not as short as a pistol but not as long as a rifle, as having carbines, and see this as a doctrinal choice. Often star troopers and security soldier figures appear to be armed with what look like carbines. In a spaceship they make sense because ranges are short down corridors and a long firearm would be a clumsy to use properly. The rules reflect this, giving pistols and carbines an advantage over longer weapons when used in confined spaces. Infantry heavy weapons are a bit more vulnerable now in that they require a shooter and a loader to be used effectively. The sole exception is a hero can work it on his or her own because… well, he or she is a hero and it’s very cinematic! The indirect fire, or as we now call it more accurately ‘blast weapons’ rules are also radically different. We’ve examined real-life methods of shooting, and advances in technology already apparent, and applied these to the rules. 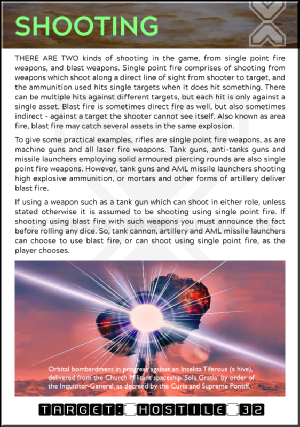 The logic is simple – if you want to try and avoid significant damage from blast fire you need to disperse your troops. That is all well and good, but it does of course mean your own return fire will also be more dispersed and less effective. 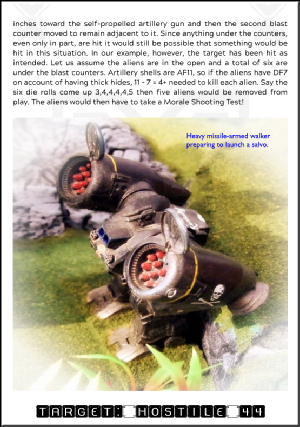 This is a nice and simple side effect of the new rules; without complicated mechanisms the player’s tactical choices give a dilemma which apes reality, disperse to avoid incoming fire but risk control issues, or stay concentrated to allow more concentrated combat force and return fire but at the risk of taking higher casualties. Sequence of play has also been changed to make them more flexible, and to enable units which are not suppressed or pinned to act each game turn, providing they pass a morale test when moving toward known enemy. In previous editions if a vehicle was destroyed, it was tough – all the occupants were dead! Now, while that can happen, there is at least a chance some will survive. This change came after the realisation that people could (and do) survive being in a vehicle which had been knocked out. Obviously this is partly affected by the nature of the vehicle’s destruction. If it goes up in an inferno you’re not likely to walk away from it, but if an armour piercing shell wrecks the power unit and stops it moving and the weapons become useless, then the chance of the occupants getting out alive are greatly improved. Close combat has been changed (again!). Now individual combats are worked out, but a melee is always resolved one way or another in a turn, even if only by the two sides disengaging. We’ve changed the rules for going prone. Hitting the dirt like that is now a voluntary act which can protect troops in the short term but means the troops are effectively suppressed. New overwatch rules are now available which integrate better with the core system and are straightforward to use, while adding a new dynamic element to gameplay. In other words, you might actually get to shoot at something coming into view during the enemy turn, or ambush a force with concentrated fire! There are numerous other tweaks which if you are familiar with earlier editions will become apparent during gameplay, such as when using flamethrowers or deadly but awkwardly-ranged HEF weapons! Finally, and while certainly optional since you can use whatever game universe background you like, we’ve beefed up the fluff about our own universe. 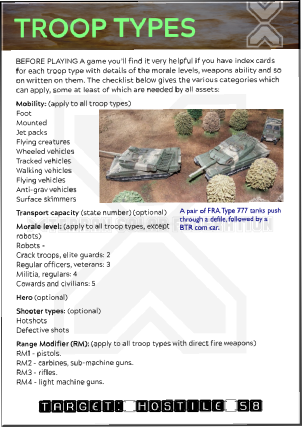 There are numerous lists giving examples of various troop types which you can use as they are, or as examples to show you how to create troop profiles for you own wargame armies. BONUS! 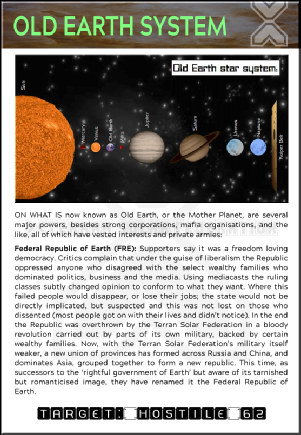 When ordering the PDF version you will be sent the full colour version and a print-friendly version. 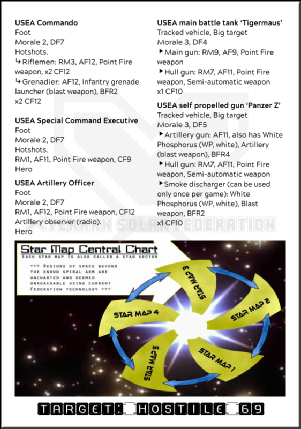 The rules include quick reference sheets to ease game play. OUT NOW! 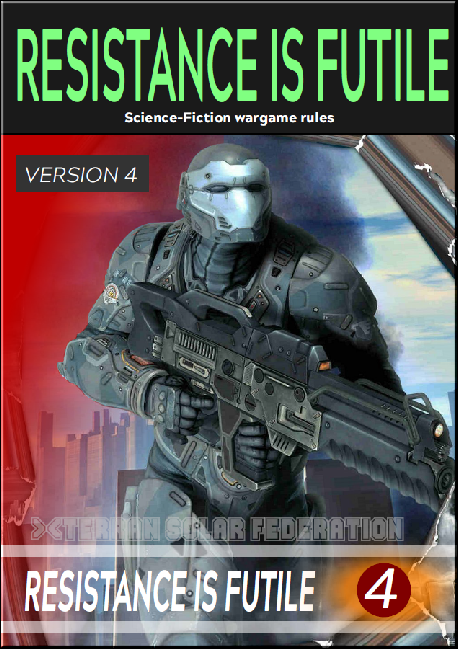 RESISTANCE IS FUTILE version 4 science-fiction wargame rules available now! Copies are sent out the same or next working day.